The Painkiller Cup, one of the more exotic races on the international calendar, has just wrapped up in the British Virgin Islands after being dominated by the visiting Hawaiians. The race is a 14 mile downwinder that heads along the north coast of Tortola (the biggest island in the BVIs), before crossing the channel and finishing at the Soggy Dollar Bar on the island of Jost Van Dyke. The winning Team Naish walked away with over half ($5,750) of the total $11k prize purse, edging out the locals from the BOGA and Caribbean Surf Co. teams. Each team consisted of two guys and one girl, with the winning Naish trifecta made up of global SUP racing young guns Noa Ginella and Kody Kerbox along with Lori Park. Meanwhile coming home fourth was the team containing America’s Cup Winning skipper Jimmy Spithill and his craziest-comeback-in-the-history-of-sport teammate Shannon Falcone, who paddled with Paula Lenny (if that surname sounds familiar, it’s because Paula is Kai Lenny’s mum – Kai was actually scheduled to be in the BVIs himself but couldn’t resist staying home to surf 40 foot Jaws instead). The runner-up performance from the “local” BOGA team of Nat Ford (St. John island) plus Bill Kraft and Isabelle Picard (both from St. Croix island) was impressive, however they simply couldn’t keep up with the Hawaiians who were too good at reading the 15 knot downwind bumps. The Painkiller Cup is one of the rising stars in a new wave of events I like to call “Destination Races” – where the location is exotic and the trip is as much about enjoying a holiday in paradise as it is about competing in an actual race. 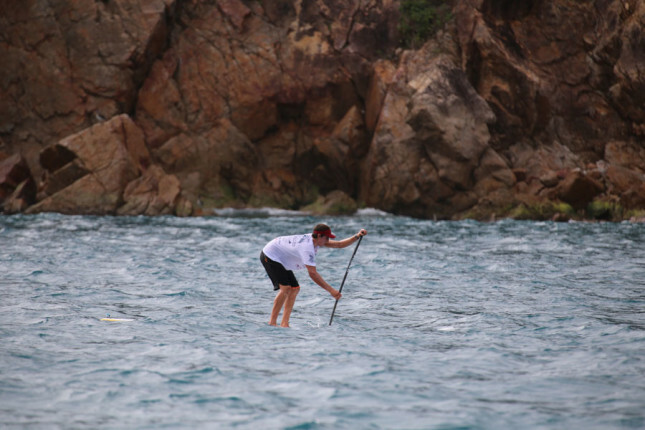 While 2014 Painkiller Cup was a one day event, there are plans to turn this into a week-long festival in 2015 (in line with the original BVI HIHO race) that’ll feature several SUP races, parties and generally just hanging out in the Caribbean. Based on the pics we’ve seen so far, it’ll have a good chance of attracting both the pros and weekend warriors that are looking to get away from the crowds. Who wants to join team SUPracer.com in 2015..? BELOW: Instagram from Noa Ginella… Doesn’t look like a bad place for a race huh?